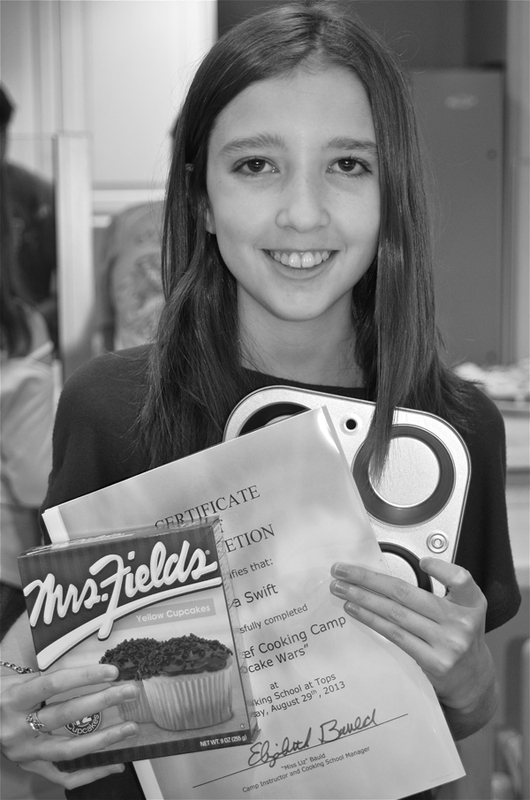 Over the summer, Alexa attended Cupcake Wars camp at a local cooking school. Over the course of the week, they baked and decorated over 400 cupcakes! On the last day of camp, campers' families came in to taste test and judge the cupcakes. Alexa is shown above with her "graduation" presents — a box of cupcake mix, a recipe book, and a muffin tin of her own. Once the score sheets were tallied, we learned Alexa and her team won 1st and 2nd place in the appearance and taste categories. Here's one of their winning cupcakes based on an ice cream sundae. The cupcakes below were made by another group, but I thought they were cute. They were called "Bake Sale Pies" because each cupcake is decorated to look like the lattice top on a pie. Aren't these beach scene cupcakes adorable? They were baked inside of an ice cream cone then decorated with candies to resemble a beach ball, floaty, and sunbather on a towel. I didn't try these duck cupcakes but I thought their Starburst beaks and donut hole heads were cute and creative. As if the girl didn't get enough cupcakes during her week at camp, last week she wanted to use the mix she received as a graduation gift to make a batch of Nutella frosted cupcakes. Nutella is her current obsession, as is cake decorating. Who am I to deny the girl some fun so I let her loose in the kitchen. I have to say these baked up nice. In a mixing bowl, cream the Nutella and cream cheese. Slowly add the powdered sugar, 1/2 c. at a time, mixing well after each addition. When all of the sugar is added, increase mixer speed to medium-high; mix for 1 minute. Add enough milk to make the frosting smooth and easy to pipe. ooooh my do these look yummy!!! what a fun summer camp!! I want to go to that camp!!!! I loveeeeee all the photos!!! CONGRATS to her team for winning!! That's awesome!!! I'm with Julie, I so need to go to that camp. Love her cupcakes! Fabulous pictures BUT NOW I'M HUNGRY~!! LOL!! What a super cool camp to go to - congrats on her team winning. They created some wonderful cupcakes - WOW! O YUM!!! They all look amazing. What a totally fun experience not to mention good tasting!! Love the cupcakes you shared here. Yum...they all look great! Thanks for including the frosting recipe! how fun and very yummy looking. That sounds like a super fun camp. Love how creative all the kids were. Terrific pics!